BrightHaven > Blog > Events > Fundraising > Strong Show of Support for BrightHaven Animals! All of us at BrightHaven—animals and humans—are incredibly grateful for your tremendous show of support! Since we launched our fundraising campaign on March 9 to save our unique sanctuary from closing, more than 385 generous donors have helped us raise nearly $41K! We remain confident that our rallying cry of “donate and share” will get us there! A Special Gift: New Logo and Branding for BrightHaven! Local entrepreneur Ted Robb (CEO of New Barn; CEO & Chairman of InHouse Creative) has been a tremendous help to BrightHaven. InHouse Creative has designed a new logo and branding that highlights the vivid, welcoming beacon of hope and healing that BrightHaven has been to thousands of animals since 1990. All at no charge to us! In February, Ted and InHouse hosted an exciting fundraising event full of good company and great food called BiteHaven. It was a big success and raised over $5K for the BrightHaven animals! “…Our [Ted’s family] journey to BrightHaven has been a sweet one. I have worked professionally with Richard Pope, one of BrightHaven’s founders, for many years. We developed a deeper connection over time, and I will share some of our story with you here. Throughout our professional relationship, Richard would often share stories from the Sanctuary: cats living to extreme old ages, pigs and goats with quirky personalities, etc. I always found it charming and inspiring, but never actually had a chance to go visit. On the home side of life, Kerry and I had been purchasing our milk directly from our farmer, Michael Leras, from his west Santa Rosa farm. We were always so impressed with his care of the animals, the farming practices he employed, and we were very pleased to spend our dollars locally with someone committed to making healthy and delicious food. 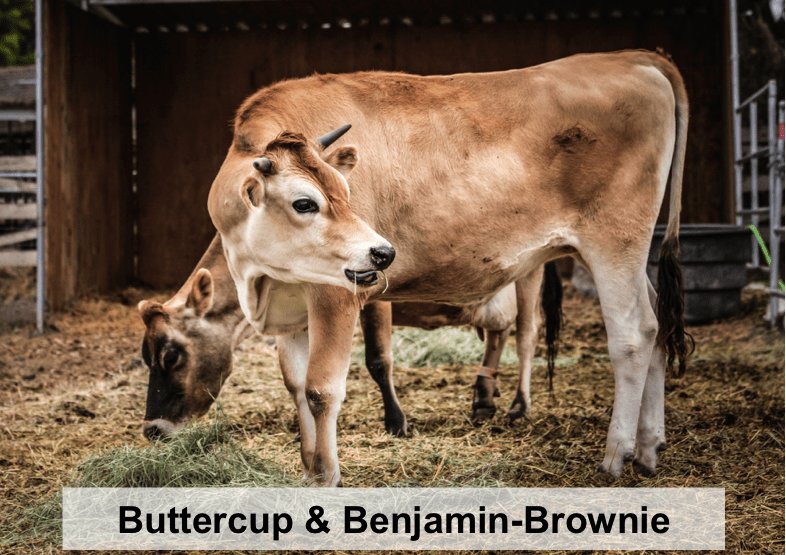 Benjamin-Brownie was a small calf when he arrived at BrightHaven with his mom Buttercup. My, how he has grown! In late 2014, we received a note from Michael’s wife asking if anyone in the “herd-share” would consider adopting their very first cow, Buttercup. She was retiring, and had recently given birth to her last baby, which turned out to be a bull cow. Unfortunately for both of them, due to the realities of operating a dairy, they were headed off to the auction yard, likely destined to become hamburgers. The Leras family had a strong connection with Buttercup particularly, as she had been instrumental in helping them start their farm, which became their way of life. I had been doing quite a bit of work with dairy brands for the past few years, and had recently decided I wanted to someday adopt a baby bull cow. I’ve always supported the underdog, and I’ve always been drawn to the plight of the dairy bull. Rescuing such an animal seemed like the ideal fulfillment of my ideals. Kerry always supported my dream, but we both always put it in the ‘later in life’ category. But here we were, looking the opportunity in the face. After some time thinking about it, the thought occurred to me to call Richard and see if we could move Buttercup and her baby bull to BrightHaven. There was some back and forth about the logistics, and from there we solidified our plan. Several weeks later, Mama and her baby moved in and made themselves right at home. It was a very sweet moment, improved only by Michael and his family bearing witness to the beginning of Buttercup and her baby’s new lease on life. But this isn’t where the story ends. 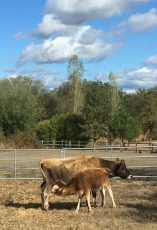 Our two cows can live out their lives together, and it’s been incredibly rewarding to spend time with our kids and alone at BrightHaven. It is a place of discovery and reflection, and it has provided us with an opportunity to slow down and see the world through a different lens. Visiting Brighthaven is like walking into a James Herriot novel, or something that feels like the imagined farm in Charlotte’s Web. The animals, their stories, and their personalities all come to life the more time we spend there. More importantly, the area lacks cell service, so it provides a wonderful an opportunity to be present and soak up the rhythm of the place; it is a sanctuary in more ways than one. Kerry and I have immensely enjoyed the ritual of taking our kids to feed the cows, horses, ducks, and the other animals who call BrightHaven home. And BrightHaven gives a special shout-out of thanks to Adam Jacobi who volunteered his time and superb web skills to update our website with the new logo and branding! Unique BrightHaven Animal Sanctuary Facing Closure!